January 2011, the City of Monroe received an award from the state for 'Excellence in Financial Reporting," while Monroe Local Schools was facing an unknown LARGE deficit. Also during the month, Steve Black was appointed to City Council and the school district received $100K in Race to the Top Funds. February 2011, a $1.45 Million I-75 Interchange Beautification project was discussed by council. Also in February, Monroe schools considered moving "inside millage" to the permanent Improvement Fund, Treasurer Thorpe explains here. 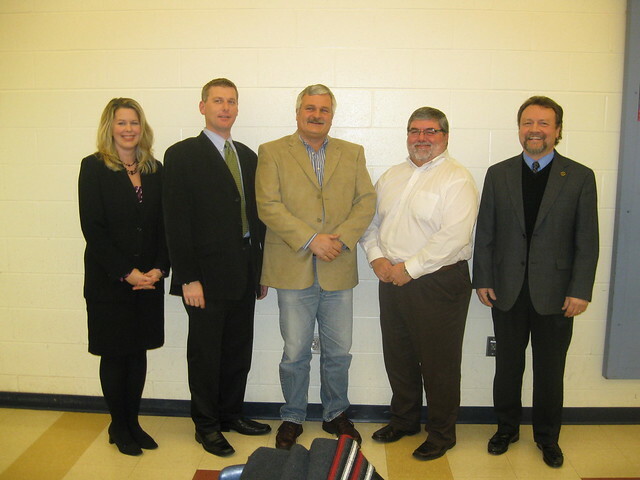 March 2011, the Monroe School Board and its two employees prepare for Teachers Collective Bargaining Negotiations. May 2011, it was confirmed that Monroe will spend over $1 Million on the SunCoke Lawsuit. Monroe police collected 123.5 lbs of drugs on Drug Disposal Day. There were nearly $3 Million in Scholarships awarded to Monroe Seniors. Also in May, then Treasurer Kelley Thorpe announced that the school district will begin deficit spending starting in 2012. Sonya Beeler was announced as the new girls' basketball coach and the teachers had a 3-year contract approved by the school board. July 2011, the school hired a Director of Technology for $63.5K, and 13 people pulled petitions for six school board and council seats, 4 for school board positions and 9 for council. Also, July saw a high number of workzone crashes on I-75 in and near Monroe. July saw the first indications of the city moving to correct its deficit spending when the City Manager Bill Brock announced that the city hadn't been replacing workers for quite awhile. Additionally, the city manager made all city employees aware of potential cuts to staff. August 2011, the board accepts the resignation of Kelley Thorpe as its treasurer, while superintendent Lolli announced that there was no book shortage despite the rumors to the contrary. September 2011, it was announced that civil war days will take place over two days in October and MLS was put into Fiscal Caution by the Ohio Department of Education. Holly Cahall was hired as the school district's replacement treasurer. She was contracted to start November 1st, 2011. October 2011, Mayor Routson cuts the ribbon at the new Monroe Lending Library, and the I-75 Interchange Enhancement Project was approved by a council vote of 4 to 3. There was also a council debate on video and Monroe had its first Civil War Days. November 2011, election results showing all council incumbents keeping their seats. At the school board, Mike Lane was ousted, while Tom Birdwell and Tom Leeds were elected. December 2011, Monroe Firefighters raised $2500 for Breast Cancer Awareness, Chief Neu was concerned with Middletown cutting their number of firefighters putting a burden on Monroe Firefighters. Forest Green trash removal company was hired for 2012, replacing Rumpke. Finally, Monroe Local Schools financial problems were upgraded to Fiscal Watch. All Monroe Council Are "At Large"
So, the City Financial problems are solved??? What is going in across from Kroger? Thank You Ms.Toni Our Wonderful Bus driver~! Old High School for Sale?